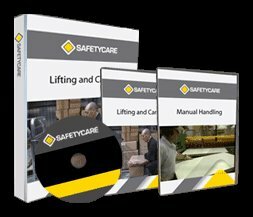 Workplace Safety Blog | Safetycare | Safety Training Videos | Free Safety Pictures and Resources: Worksafe now sells 'Spare Body Parts' from vending machine! 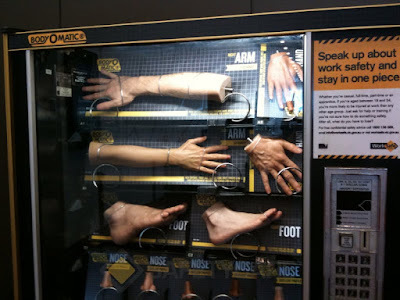 Worksafe now sells 'Spare Body Parts' from vending machine! Our Australian safety team attended (and presented some seminars at) Work Safe week in Melbourne, Australia this week. There were many seminars on Occupational Health and Safety being held which is just fantastic. All held in the new section of the Melbourne Convention Centre. In the foyer there was this rather odd vending machine. At first glance it looked like a regular food-type vending machine, but as curious onlookers neared, it could be seen that the products within were body parts! We at Safetycare loved this. A simple artistic installation that reminds us that we can't replace our body parts as simply as just buying them from a vending machine, so we had better look after our own!